The Faculty is pleased to share that Professor Adelle Blackett, Ad. E., has been appointed to the Human Rights Expert Panel of the Government of Canada’s renewed Court Challenges Program. The Court Challenges Program (website) will provide funding to people and groups in Canada who wish to bring or to join a claim constituting a case of national significance related to official language rights or human rights that has not yet been brought before the Canadian courts. The Official Language Rights panel and Human Rights panel will assess funding applications to the program for court cases of national significance and will allocate resources accordingly. Adelle Blackett is Canada Research Chair in Transnational Labour Law and Development at the Faculty of Law, where she teaches and researches in the areas of labour and employment law, trade regulation, law and development, critical race theory, and slavery & the law. 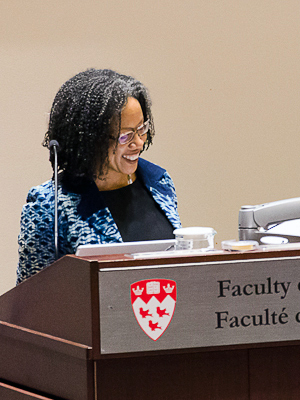 Professor Blackett gave her Inaugural Lecture as Canada Research Chair in Transnational Labour Law and Development, entitled “Beyond a Boundary: On Transnational Labour Law, Discontent, and Emancipation,” on November 29 (see photos). In the winter semester, Professor Blackett will also lead a course entitled “Transnational Futures of International Labour Law — La justice sociale dans le monde du travail” to celebrate the 100th anniversary of the International Labour Organization. Sponsored by the Pierre Elliot Trudeau Foundation, the 12-week course will feature different speakers from around the world each week. Speaker presentations will be open to the public and webcast live on the Faculty’s channels. Further information will soon be provided on the Faculty’s website and social media channels.